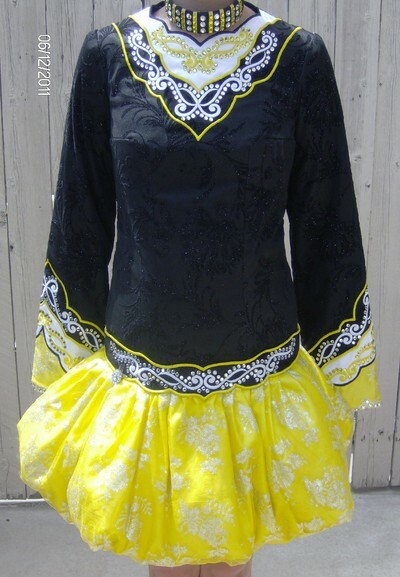 Excellent Condition black and yellow drop waist with soft puff skirt. Includes yellow with black polka dots spankies and headband. The bodice is black velvet pattern overlay. Skirt is yellow stain with sparkle yellow lace overlay. The dress has lots of clear and yellow Swarowski Crystals. This dress has been worn 6 times, and has moved from Novice to Prizewinner to Prelim within 9 months. There is room to let out or let down. Asking Price: $US950. Shipping costs are included for my own country, overseas shipping is extra. Will accept returns and refund the cost of the dress, buyer to pay all shipping costs.